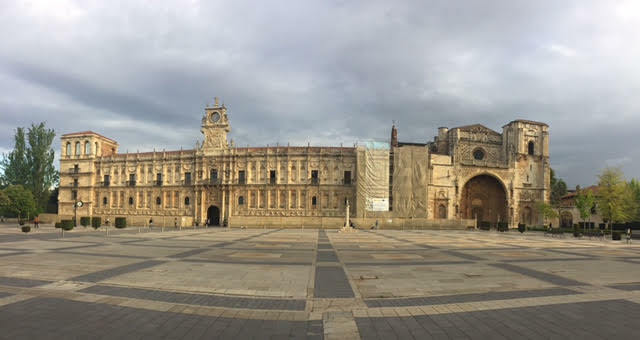 Continued from Part 2, Days 13 – 23 Tosantos to León. Continue to Part 4: Days 34-40. At 7:30am I bid David Goodbye from our sweet charming “Hotel” in León. – Many Pilgrims choose to get a Private Room once they get to León. I helped Kyle/Scout, Raika and Maika Reserve a Private Room in a Hostal as we were Walking into Leon yesterday. – 30€ for a Single Room. Sweet, nice, simple, clean in the Medieval part of León, minutes walking from the Cathedral. David and my favorite place to stay in each town. We use John Brierley’s Camino Guide. If you would like the List of the Places we have stayed in; every 12-14 miles (20 Kilometers), FB Message me. We find 12-14 miles (20 +/- Kilometers) helps our Feet, Knees, Hips, Backs to be the HAPPIEST. 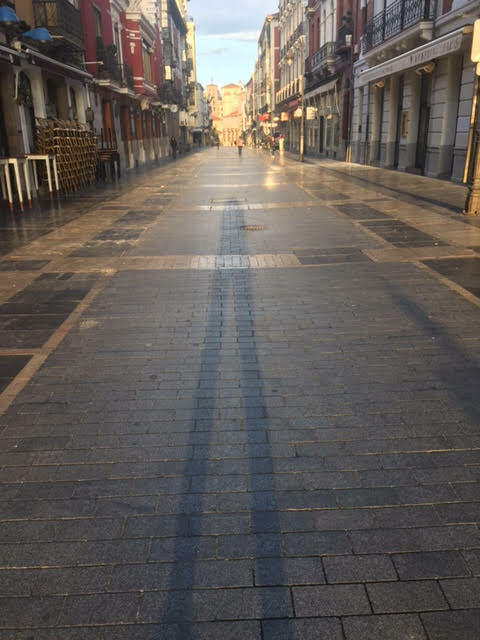 At first light, I walked up Calle Ancha towards the Cathedral out of León. It was hard for me to leave!! The empty, freshly cleaned Medieval area that is void of cars, in the morning light, is SO special!! – I took a little Video. You can check out my Camino Photos & Videos on Instagram @cathyseitchikdiaz. I bumped into 50 year old Keiko from Japan, for one last time, as she needs to return home to Tokyo. 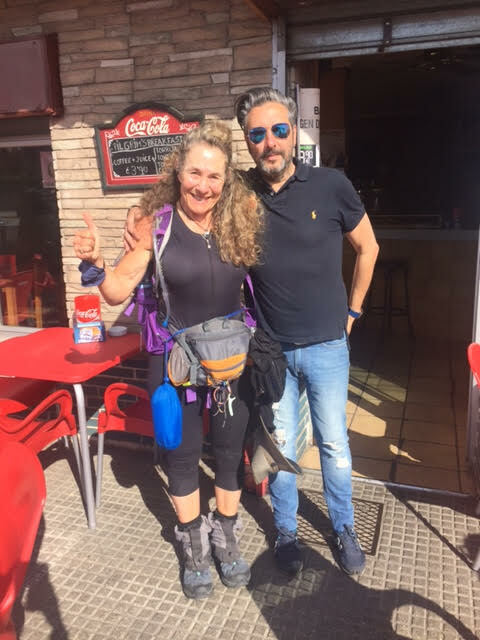 Next time she will finish her Camino and Walk; Leon to Santiago. I took a number of more Photos, and a Video of the Cathedral bells, and then told myself, “I have to GO. Next stop Mazarife.” I continued walking for about 10 more minutes through the quiet narrow car free streets of Leon to the outskirts. I felt so much emotion, still wanting to stay and experience this special early morning. Clean empty early morning, in Leon and all old city Medieval streets. -I love long skinny early morning shadows!! As I started to walk through the regular car filled city streets of Leon, I came upon one more gorgeous Medieval structure. – The Parador Hotel of Leon. From the 1500’s, it was originally the “Hostal de San Marcos” for Peregrinos. 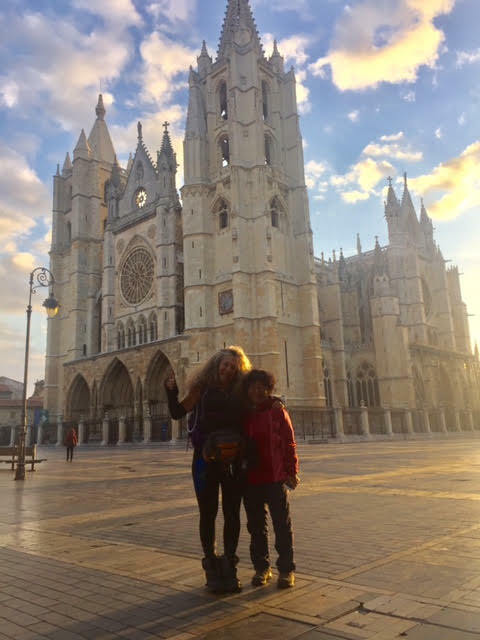 – The problem for me is that is at least a 15 minute walk to the Cathedral and the heart of all the Pilgrim action and connections, plus, the Basílica, etc. – If I wanted to stay in a Parador, I would do it in Santo Domingo and Santiago as they are in the Center of the Medieval area. I took some photos of the Parador, walked inside to view it again, and to see if I saw any of my Pilgrim friends heading out. I met a nice Argentine couple taking a photo at the Iconic Parador Pilgrim. I asked the husband to take one for me. Sometimes I wish I had some photos of me without my Waist-Pack with all my needed supplies hanging down, but that would be TOO MUCH work to take it Off & On, just for Vanity. Leaving Leon, one gets to decide which Path they want to take. – Alternative Route this year. Walking out of Leon, I met and walked with more awesome Pilgrims…..
– She will be in San Francisco, May 18 to June 22. I got her contact info and told her she can stay at our house in Santa Cruz, as it is a BEAUTIFUL place to visit. – Patricia from Brazil was walking with Mara. I chat with and make friends with the Cafe owners. I tell them, I hope to see them next year, same time. 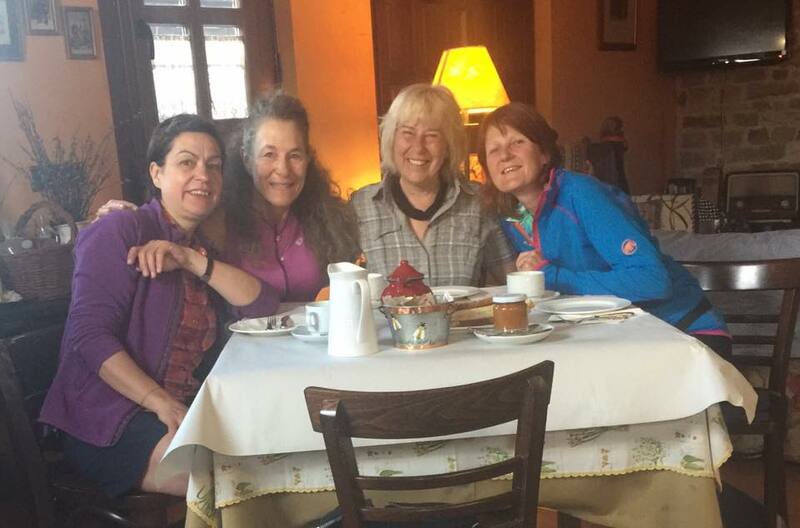 Walking to Mazarife, I met and walked with MORE awesome Pilgrims…..
– 3 German women, I said “Buen Camino” to while Walking “into” Leon yesterday. – The women from two nights ago, in the Kitchen and their iPhone Cable challenge; from Hungary & California. – Two new young women from Poland & Germany. We walked and talked for an hour+. His wife walked with him last year. She now says she walks to Walk with him again next year. He was very interesting to Walk & Talk with. 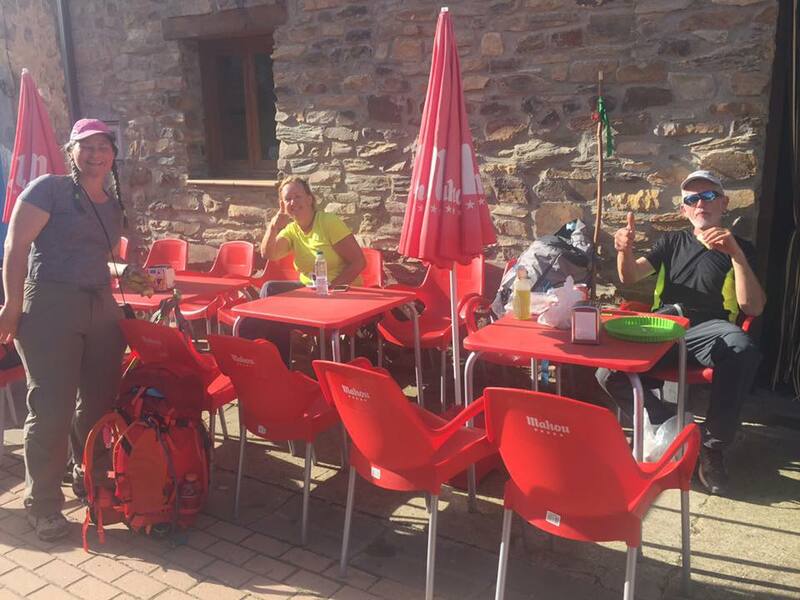 In our Alberque in Mazarife we saw…..
– the same young Rowdyy/Fun young Group of 6 “Camino formed International Family” that we met at the Boadilla Group Meal. – Retired Danish George that was not so nice to me at first, later apologized, and now I enjoy seeing him. He is probably a “loner,” so I try to be respectful of that. We don’t get to know them because we only met them once. – Tom from Phoenix – I was talking to him about Reservations so that his brother will be more relaxed. – David and I went to the town Church. The woman inside gave us information about the History of the Church and about the Storks that are on Top of ALL Church Bell Towers. I had dinner with …. – Beth from Canada, that I met 2 weeks ago and have seen her off and on. PS: If I don’t Post my Update it is because of ….. The Alberque says it has WIFI, but the Bandwidth is so poor, nothing really is Sendable or Postable. As I was preparing to leave Leon I happened upon an article that described an event that occurred on 29 May 1966. – There was a lightning storm that day and a huge bolt struck the lightning rod on the roof of the Cathedral. The grounding failed and the wooden beams caught fire! This was a catastrophe! The Cathedral was burning! One of the great Gothic structures in all of Europe was in danger of destruction! The fire department arrived and was determining how to put the fire out when a stone mason was able to reach them and convince the Province Governor to let the wood burn without water, which would have destroyed many relics in the interior. This saved everything inside. After the fire burned itself out repairs were begun and the Cathedral was saved. On to the next town we go:). – Today is a rainy day. It’s cool but not uncomfortably so and the wind is not too bad. This is a town we haven’t walked through before as the path splits and one stays alongside a road and the other branches off cross country. – Cathy took the cross country route. Mazarife has 400 folks with a couple of small stores and cafes. Our rest stop is Alberque Tío Pepe and it is a relatively new albergue with a couple of private rooms and a dorm area. I always opt for the private rooms:). – There is a Cafe attached and at this stop Breakfast is included. That’s not always the case and for the Dorms it’s very rare. You can always find a Cafe to get something in but it might be in the next town. I guesstimate that we are about 315 kilometers from Santiago now. That’s about 2 1/2 weeks to go. Of course, Finisterre is 5 more days and Muxia is 2 after that. 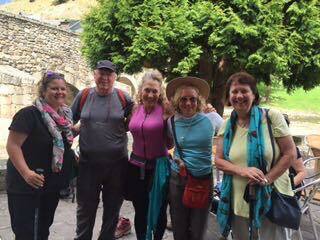 My daughter Susan and her beau Robert started walking from St Jean Pied de Port today! They hope to get to Burgos during this couple of weeks. I’m really happy that Susan seems to enjoy the Camino as much as Cathy and I do. With our Alberque in the background. There Pilgrim Statues all along the Camino. Not ALL Pilgrims, Nor ALL Cafe people are “sweetness & cream,” but 99% are. I am writing this just because it always takes me by surprise. – The Bar owner in San Juan, after Belorado, has a monopoly for the small town of his Bar & his Hotel and one Municipal Alberque & one Church. So I just pass by. – A Pilgrim in Navarette was in my Dorm with 2 other women. Just the 4 of us. This Pilgrim was not a happy camper. I prayed. – Another Pilgrim spoke rudely to me once. Then days later apologized. – Another was angry I wasn’t drinking wine. These are 4 experiences in the course of 2.5 Caminos and thousands of people. I would say that is a VERY small percentage. David and I LOVE Walking the Camino!! We find the Hospitaleros, Cafe Owners and Workers, Shop Keepers, Pharmacists, Community Members and Pilgrims to be kind, loving, bend over backwards helpful and NICE!! It is a NO Brainer why David & I want to come year after year. 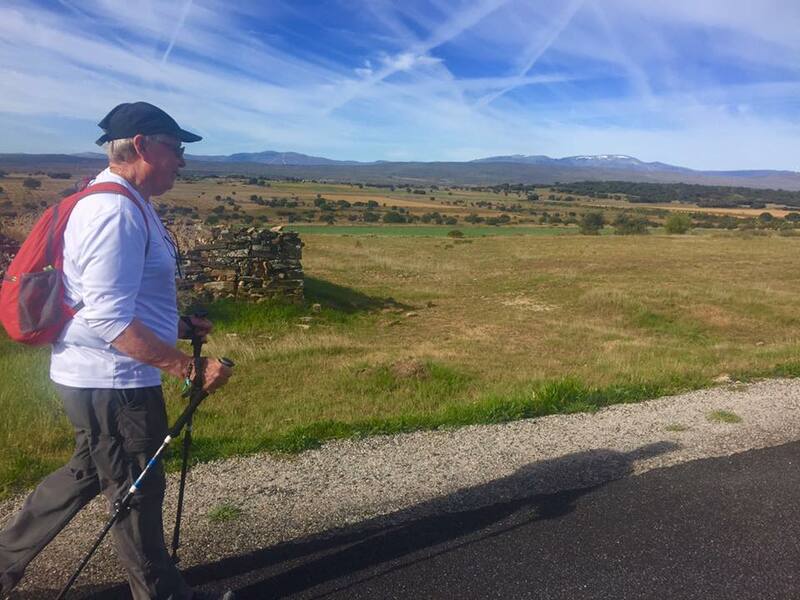 – Exercise, Fresh Air, Personal Connections, Culture, History, Variety, Doable Challenges and …..
An APOC Pilgrim, Richard Valdez, messaged me and said EVERYthing we are experiencing On The Camino, right now. I very much LOVE getting your messages!! If I haven’t responded yet, I will!! I feel such a Kindred Spirit with Camino People Online & Walking. – We are ALL such Kindred Spirits. I have 2 sons, 35 & 40 years old. When they were younger I came across this book called, “Me Too Iguana.” The Iguana wanted to be JUST LIKE his other animal friends; Lion, Tiger, Bear, Rabbit, etc. He wanted to be LIKED & INCLUDED, and he thought if he was the SAME as them, he would be guaranteed this. In the end he learned he WAS Liked and Included just the way he was. That old childhood longing has a way of lingering. Each time I Walk the Camino I experience a FREEDOM from that longing. This 3rd Camino I am Feeling…. Stronger than I ever thought possible. Not afraid of another person’s anger & disapproval, as I have ALWAYS been. 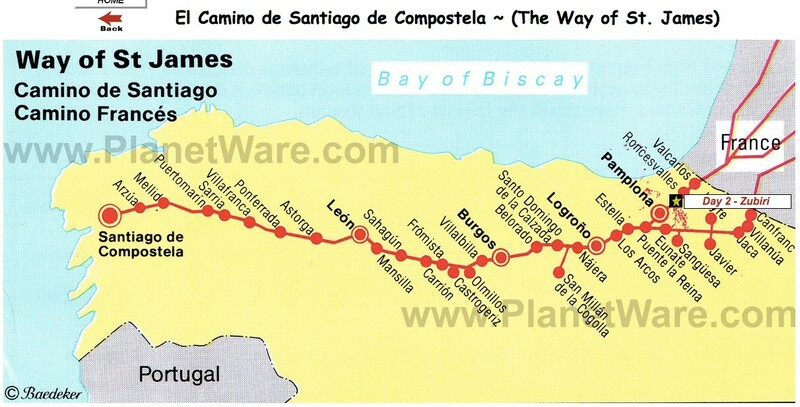 – Start in SJPP & Walk to Santiago+ in 35 Days. Others in 45 Days. Others in more. – Start in SJPP, Le Puy, France, or other far off places, and Walk a few weeks at a time each year until they get to Santiago. – Stay mostly in Municipal Albergues, others mostly in Private Albergues. – Stay in Hostals, Pensiones, Casa Rurales, and Hotels. – Stay in Dorm Rooms. Stay in Private Rooms. – Walk into a Town and find a Bed or Room. Reserve their Bed or Room, the night before or weeks before. – Carry their all of their belongings. Transport their belongings. – Walk 100%. Taxi, Bus, Train as needed. – Walk 1000 miles. Walk 100 miles. – Walk for 2 weeks. Walk for 4-6 or more weeks. – Plan themselves. Pay an agency to Plan. 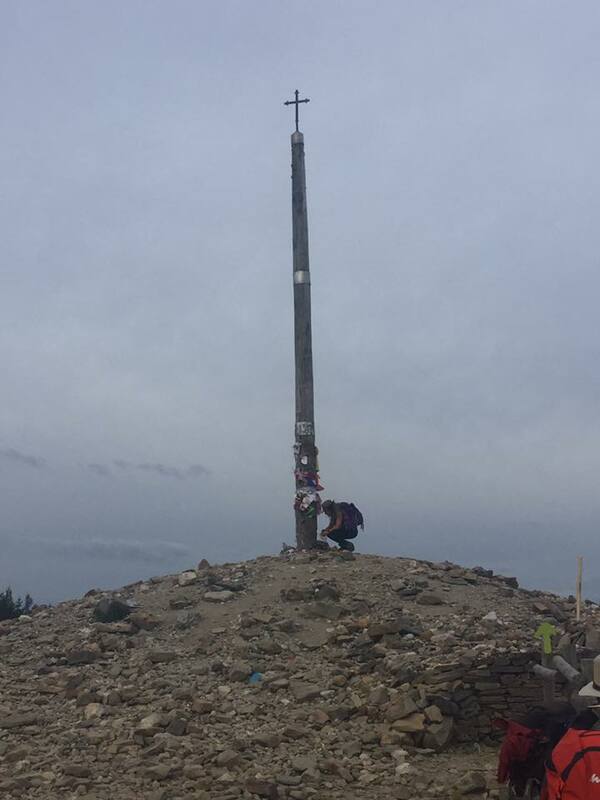 Today the Villadangos Del Paramo and Villar de Mazarife Pilgrims, reunited and headed towards Hospital De Orbigo, Villares De Orbigo and Astorga. There are soooo many French people I wish I could connect with but the language presents a challenge. Today I walked and used Google Translate with my new French Pilgrim friends. – We bonded over the challenge women have about going to the Bathroom out on the path, with our Backpacks and Waist-Packs on. – They taught me a new “sideways” Photo Shot for Walking the Camino. These French women are SO Smart! What I do when NOT sure which way to Walk. As I was Walking into Villares De Orbigo, I saw a couple my age from Denmark, Theo and Lea, sitting on a bench having Lunch. The Last time we saw each other was Walking up the Pyrenees on Day 2. It was a pleasant surprise to come upon them!! Plus, to check in, and hear about their Camino. Our Albergue & Dinner were AWESOME!! – Christine makes a fresh delicious dinner and homemade Apple Cake dessert!! – We were 15 in total at a long table outside in the enclosed Patio. Today is Marshall’s 40th birthday! Happy birthday from Spain Marshall. Today is also the first day I’ve walked part of the Camino since to Burguete on April 13th. It was only about 3 flat miles but it’s a start:). Cathy walked about 12 miles and I took the mechanical horse to the medieval bridge going across Rio Orbigo into Hospital de Orbigo. The Puente is quite a sight with 20 arches. It has been here for hundreds of years, although it has suffered thru degradation and deliberate destruction at various times in its history. The last episode of destruction was in the time of Napoleon when it was razed by the townspeople to slow his advance further into Spain. During the Middle Ages there was a small village along the left side of the Órbigo river with a small church dedicated to the Virgin Mary, called Puente de Órbigo. In the 16th century the Knights Hospitaller established a pilgrims Hospital/Hostal on the right side of the river that came to be called Hospital de Órbigo. The town was a battle site in 456 between forces loyal to Theuderic I and Rechiar. Due to the bridge it was also important during the battles during Spain’s Reconquista with Almanzor passing through the town at least once. Closer to the modern era in the 19th century, the town’s inhabitants destroyed their iconic bridge to slow the advance of Napoleon’s forces into Spain. This 13th century bridge is the longest one on the Camino at 204 metres long (approximately 670 feet) and has 20 arches. The river that it crosses doesn’t seem to appear to warrant such a lengthy bridge, but prior to a dam being built at Barrios de Luna the river was a lot wider. The bridge also has the legend of El Paso Honroso (Honourable Pass) attributed to it. El Paso Honroso was the name given to a jousting tournament of sorts undertaken by the Leonés Don Suero de Quiñones. Don Suero was in love with a lady by the name of Doña Leonor de Tobar, who unfortunately did not feel the same way. This 15th century knight considering himself a prisoner of her love, decided to wear an iron collar around his neck every Thursday as a symbol of being enslaved by his love for her. As a way to empress both the lady he loved and King Juan II, as well as a way of freeing himself from his enslavement, he decided to embark on a surprising joust in the style of the knights of old. At a meeting in January 1434, Don Suero proposed to the King that he would break 300 lances on the bridge over the río Órbigo close to a pilgrim Hospital run by the order of San Juan (Saint John) and only when he had accomplished this would he remove his iron collar. Many knights arrived from all manner of places including Germany, Italy, Portugal and especially from the kingdom of Aragón. The tournament started on the 10th of July 1434 and lasted a month during which time Don Suero and his 9 fellow knights defeated 68 men, killing only one and managed to break nearly 200 lances. The men who were judging the contest decided that this was enough and during a ceremony removed the iron collar from Don Suero’s neck. There is a slightly different story in that Don Suero offered the tournament to Saint James saying that he and the other 9 knights would challenge those undertaking the pilgrimage to Santiago until 300 lances were broken. When the tournament was finished all the participants went to Santiago de Compostela to offer the arms with which they fought to the Apostle. It is also said that the iron collar (now gold) worn by Don Suero is hung around the neck of the image of the Apostle that is used in processions. Unfortunately like so many of these stories it doesn’t have a particularly happy ending. A few years after the tournament Don Suero lost his life at the hands of one of the knights that had been defeated and who was seeking vengeance for his defeat. Every year in early June since 1997 the Fiesta de las Justas del Paso Honroso takes place in a field close to the bridge in commemoration of the legend. The story of el Paso Honroso is mentioned in Don Quijote and may have been an inspiration for the old knight himself. The Iglesia de San Juan Bautista, on the other side of the bridge is what remains of the pilgrim hospital which had been built in the 12th century by the Caballeros de San Juan de Jerusalén (Knights of the Order of Saint John). I was prepared to joust when I arrived at the bridge but to my dismay I learned that I was 583 years too late! It was hard to push myself out of Christine’s, AWESOME -Albergue Villares Casa de Pablo Y Belen, that felt like a Grandmothers loving home filled with warm kind interesting people. – Abundant Breakfast with Homemade Yogurt & Granola, Fresh Toasted Pan, Cereal, Milk, etc. – A GREAT place to stay on my 2nd night after Leon, and before Astorga. I stopped in a Cafe on the way to Astorga today and I heard it was “Día de la Madre.” One loses track of Days & Dates On the Camino, I have been told. For me that often is true. ALL good, of course!! – I am lucky and blessed to be the mom of two men, 35 & 40. Usually I write down EVERYone’s name as I walk. My Pilgrim friends smile and know this about me. – There has been something in me for as long as I can remember, that I like to “connect” with others and I always have been very good about staying in contact, keeping connected. – This morning as I was walking, an Italian 30-ish woman and I started talking as we were laboring up a hill. We walked and talked for a while. She, like me. hopes to make it to Santiago. She likes to walk 20 to 25 Kilometers a day. Normally I would have asked her name and written down these things in my Notes on my Phone. I have always had a poor memory. Writing things down has always made me feel more relaxed. Not remembering people’s names, places we have been, and on the Camino, Walked through, etc etc is, and has always been uncomfortable to me. I solved that by taking copious notes in college, and beyond. – One year my friends wanted me to be “Post-It Note.” Lady. They wanted to take all the “Post-Its” from my week, that were on my Car Dashboard, on my Desk, stuffed in my my Bra, in my Agenda, on my Kitchen Counter, etc -And Tape them ALL over me!! – Once I got my iPhone and trepidatiouly “let go” of my Paper Notes, EVERYthing gets written in my Phone; in my Calendar, my Notes, etc. – I luckily I took all of my children challenges and made them work for me; ADD, ADHD, OCD, well -the whole alphabet, I say. Writing things down served me well. I am organigized. I have information to share with others as a result. My bosses always valued this attention to written detail, as did my students. I write things down for my Spa Sisters while at the Gym working out, or if out on a Walk. David and I don’t need to dispute a memory, as I can just check my Notes. Well today I felt a freedom that most people have felt their whole lives. – I didn’t need to write this lovely Italian woman’s name down. I don’t know what this means exactly. So, don’t be surprised, If you bump into me tomorrow, I still might write everything down. – I will keep you Posted. I love walking into ALL of the towns and cities. I love the cities with medieval non-car streets, outdoor Cafes, people walking arm in arm, babies in strollers, kids on scooters, Churches, Cathedrals…..
– Nadia & Lisa from Germany taught me during our 2015 Camino how to take a Photo and capture the whole Cathedral; top to bottom. – Start from the bottom and photo UP. It turns out GREAT!! I love meandering through these awesome old towns & cities; Medieval mixed with the Modern of today, with women dressed nice, children and men as well. – I walked with 50-ish French Corrine. We loved our Hotel Rural La Veleta; aka-B&B, with 5 Bedrooms, charming stone walls, etc. – Dori the owner and “Hospitalero” was awesome and so was her whole family. – It was Mother’s Day, so her 2 daughters, son-in-laws, grandsons, etc were there for their 3pm Sunday meal. It turned out that her son-in-law is the top Orthopedic Surgeon at the Hospital in León. And…..
Dr Juan José Chico gave David a full on Consultation. Plus, a Prescription of what he needed to get at the Pharmacy. During this 3rd Camino, I am enjoying it soooooo much that at 1:30-2pm, after 5-6 hours of 12+ miles, I am not really ready to stop Walking for the Day. But I have learned that…..
– Walking 12-14 miles a day, with a 12-15 lb (7 kilos) for me, is good, is best. – Giving myself an afternoon to shower, wash clothes, see the town, eat, food or farmacia shop, commun with Pilgrims, Hospitaleros, Shop Keepers, etc is also good for me. 55 days to Walk (60 days total, with Flights)…..
– Last year we finished in 51 days. If I walk more Kilometers each day, I will finish sooner, and I don’t want my Camino to finish sooner. Therefore 12-14 miles (20 Kilometers) is good for me for many reasons. If you also like 12-14 mile (20 Kilometer) Daily Stops, I am creating a List to Share with others. FB Message me and I will get it to you when complete. David did a really nice job of figuring it out. It is not as easy as one would think. There are MANY excellent guides from France, Germany, etc. We use John Brierely’s Camino Guide. We left Christine and her husband and their wonderful Albergue in Villares de Orbigo at 8 AM after a nice Spanish style breakfast. Her husband offered to drive me to Astorga for about half what a taxi would be and he and I had a nice conversation during the drive. He dropped me off in the center of town and I did a bit of exploring before setting off to our next stopping point. Astorga was established over 2000 years ago! The cathedral here is from the 1600s. It took quite a long time to complete so it contains several different architectural styles. There is also an Episcopal palace here designed by Gaudí. To all that think the Camino is only “roughing it,” NOT!!! Or at least, it doesn’t have to be. We have choices! -Once here, many of us who thought we were ONLY going to stay in Dorm Rooms, change our minds and stay in Private Rooms as needed. – EVERYone gets to do what feels right at the moment, and we all love each other for it! – As my Aussie friends say, “Good on YOU” for that decision! – There are plenty of Private Rooms; in Pensiones, Hostals and Casa Rurales -aka, B & B. This morning, David and I had a sumptuous breakfast in our “Casa Rural” with Host & Owner, Dori. Joined by our 3 German Pilgrim friends. – Fresh Coffee & Warm Milk, Fresh Toast & Homemade Jam, Fresh Scrambled Eggs. ALL a bit much for me but on occasion I eat it. – I usually prefer Fruit & Veggies as I walk. Everything is buyable in Supermercados or Fruterias. This morning as we walked out of “Murias de Rechivaldo” we passed the outdoor Cafes filled with Pilgrims and to my delight I saw Peter & Paul, Diana, and others. We had taken an Alternative Route to Mazarife, after León, so I was excited to see them! David Stewart is a walking!! David Walked part of the day today, YEA for him! He is back in the fold! – He Walked 5 miles, as he had done the last 2 days. Part Walk, Part Taxi; depending on the Terrain. That is me with the Purple Backpack up ahead. David Stewart took the photo. David had heard all about them as they had heard all about them!! They finally got to meet today. The Patio to the left of the entrance to the Cowboy Bar was filled with Camino Pilgrim friends! I bid David farewell as he got a Taxi to Foncebadon. I headed on with Peter from Melbourne and then Helen & Alex from Sydney. They all stayed in Rabanal and I headed on to Foncebadon to meet David. Before leaving Rabanal, I stopped into say HOLA to Susana in her “La Dispensa” Tienda. We talked a lot last year when I was in Rabanal. Walking out of CHARMING town of Rabanal, I turned to look back & take a photo. The stone built Hostals & Albergues are SO visually appealing to me!! I always turn around to get a view of where I had been and to see the view from that perspective. From Rabanal to Sarria, we are back to Walking on a dirt path, like we did, into into Zubiri on Day 3. This time, with breathtaking hills, mountains and countryside. On the way to Foncebaddon from Rabanal, I came upon Bülent, from Switzerland, who had taken my photo with Keiko the morning I was leaving Leon. – We walked and talked into Foncebadon. He said he usually stays in the Public Municipal Albergues but this time we turned the corner and there was David, Peter and Diana having a Beer outside in the sun. 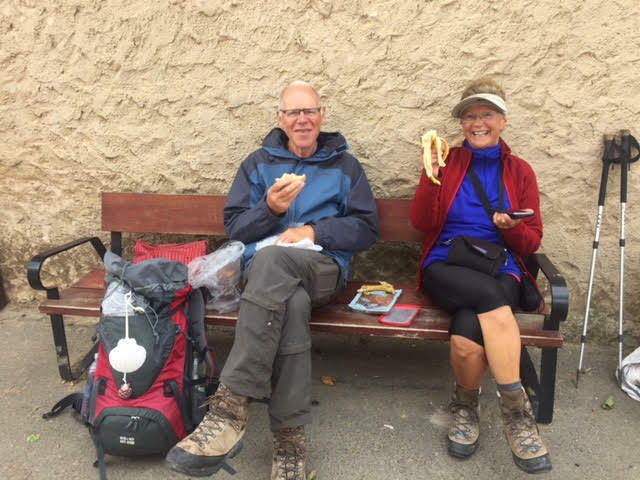 – Typical of the Camino, Bülent and Diana had already met a number of times. We introduced him to Peter. Both Peter and Diana were staying in the Albergue Dorm Room. It was €17, with Dinner included. Bülent stayed. In the ONE Street Town of Foncebadon, there were about 6 places to stay. – We walked up the street and found a Tienda where we could buy Fruit, Drinks, Snacks, etc. – Pilgrims filled the Cafe tables outside; talking, laughing, exchanging photos, etc. Some I knew. Many new Pilgrims. Anne from Seattle. Diana from Holland. Other Pilgrim, not in my Database, yet. I learned about AirDrop on our 1st Camino in 2015. An easy way to Share Photos with each other without needing to Email, Message, etc. It works: iPhone to iPhone. 1. AirDrop has to be on. 3. 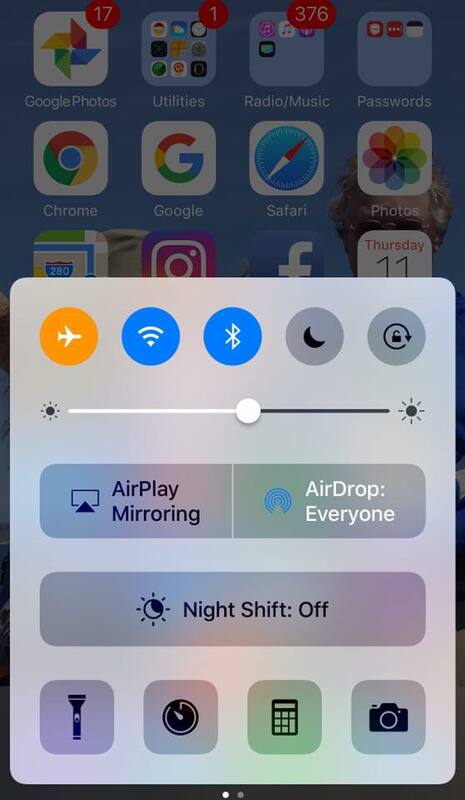 Select 1-5 pictures you want to AirDrop to another person’s iPhone. 4. Touch the Little Box with the Arrow pointing Up. 6. When the person’s iphone visually appears in the Blue Circle Location, Touch their iphone imagine on your iPhone. 7. It will say “waiting” on your iPhone, and “Accept” on the other person’s iPhone. The pictures are now in “Photos” on their iPhone. ***If you have a problem, let me know and I can walk you through it. – It is EASIER than Texting, Messaging, WhatsApping, Emailing. My neighbor has been reading our Camino Updates & Posts for 3 years: April/May 2015. 2016, 2017. She also asked how I ask for the ages. – Sometimes I ask, if someone looks “my age,” or if really young, “4, 12 or 18.” Otherwise, I just guess. I want to give an idea of what the Camino population looks and feels like, since I can’t show pictures of everyone. I should say, “Peter is 65-ish,” but I just guess the age, and figure it is close enough, to give an idea of the population Walking the Camino. They’re between School and/or Jobs. *Sometimes they are going through a life challenge and they see the Camino as a way to evaluate their life and figure out what to do. *Sometimes they are taking a week or two off per year to Walk the Camino, little by little. * Emotional, spiritual, religious reasons. * Culture, nature, physical movement, community. I am sure this list could be expanded upon by Pilgrims that have Walked the Camino. – Are people able to bike the full length of the Camino, and if they do, are they accepted as Pilgrims or ostracized for doing it the “easy” way? Bike Pilgrims are “Pilgrims,” on Bikes,” in my experience. They are not “ostracized” at all. Many of the paths seem harder to me on a Bike than Walking. 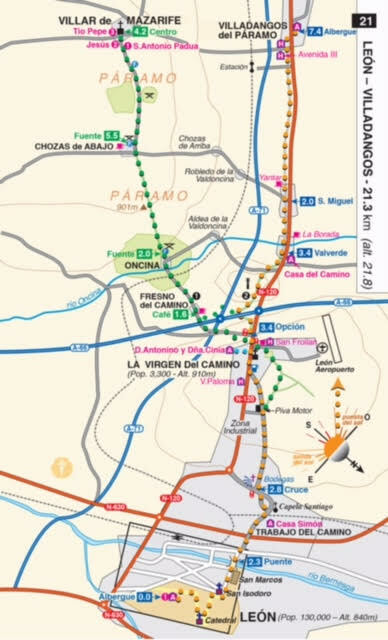 – “Bike Pilgrims” also use the Road sometimes, and not the Walking Camino Paths. – They usually are with at least one other “Bike Pilgrim.” I think it would be lonely otherwise. 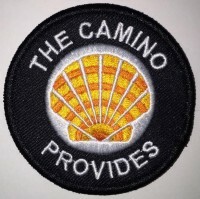 – I imagine they have their own “Camino Bike Community,” among themselves. They are gone too fast for “Walking Pilgrims” to make a connection. Not saying it doesn’t happen occasionally. ***I have a friend in Santa Cruz that Biked from St Jean Pied de Port to Santiago with her sister. She will Walk the Camino with her mother this Summer. I will ask her to explain the differences & similarities to me, when done. After a nice breakfast at our Hostal (it was very like a BNB) we started walking to our next stop. – The first 9 K was flat or gradually up. That’s the part I walked:). After El Ganzo the slope increased until it was steep in parts. Cathy also walked this part:). I could see parts of the trail from the taxi and it reminded me of what it was like. We walked it last year and it was very rocky. My knee would have had problems with it. Yesterday at our Hostal the hostess had a Mother’s Day dinner with her family. We learned that her son-in-law is a prominent Orthopedic Surgeon in Leon. As soon as he learned of my knee problems he volunteered to examine it and give me his professional opinion. These Spanish people are the most friendly and giving folks I’ve met. It’s such a pleasure to be here and to interact with then. – He feels that I may have a slight displacement of my patella (knee cap) and that’s what is causing my pain. – He gave me some prescriptions to take and said to continue to wear a knee support, but not the one I just bought with the structural ribs in it. It should be neoprene with an opening for the kneecap. I just happen to have one of those in my collection of knee braces:). After my free exam we went to a local restaurant next door for our afternoon meal. I call it “Lunner”. This particular area of Spain is the “Matagato” area and it has its own unique cuisine. – Last year Megan and Shellie sampled it so of course this year I just had to:). – There is vino tinto of course. The first dish is stewed meat. I recognized pork and beef and there were several others. One piece was a pig’s ear. No way! Two pieces looked like boiled skin and fat. No way! Two small chunks were just fat. No way! There was something that looked like bread but definitely was not. Yes way:). Several other parts I ate. The bottle of vino tinto helped:). – The 2nd course was garbanzo beans with cabbage and it was delicious. – The 3rd course was noodle soup with the broth from all the meats. It was okay. – The dessert was a lemony yogurt like dish that was also good. – The vino tinto helped:). Foncebadon is 1450 meters high. It’s near the top of a ridge that we crest tomorrow before dropping back down again for a few days. There will be another crest in our future. Most of the days now entail some ups and downs. As we left Leon we also left the Meseta or the flatter part of the Camino Frances. – The Plains in Spain. We looooooveeeeeeed staying in Foncebadon and the ease it felt to Walk up to the Cruz De Ferro. What a wonderful morning it was, to Walk up to the Cruz de Ferro, with David. – Beautiful Heather and other Wild Flowers!! – I sprinkled some of my Mother’s Ashes, for the 2nd time. – I will sprinkle more at Finisterre, as I did last year. My mother instilled in me a love and desire to travel, meet different people and see different worlds. – I struggled with being fit my whole life. My weight UP & down. My mother would come to wherever I was to help me get back on track. Finally, in my mid 40s I continued on my own. It is my biggest challenge, staying right body size & fit. At the same time, the older I get, the more I value it. – Walking the Camino is good for me in MANY ways. My mother would have approved, and been happy I was doing it. And happy I return to Walk it every year. She comes with me, every Camino. Cruz de Ferro. Prayers & Love for my mom. After Walking up to the Cruz De Ferro, David and I continued Walking to Refugio Manjarin, a rustic Alberque of 26 Beds. – Jose called a Taxi for David as his kneecap would not have fared well with the steep rocky decent. I got to Walk for 2 hours through the MOST abundant and BEAUTIFUL wild flowers that kept going on and on and on. 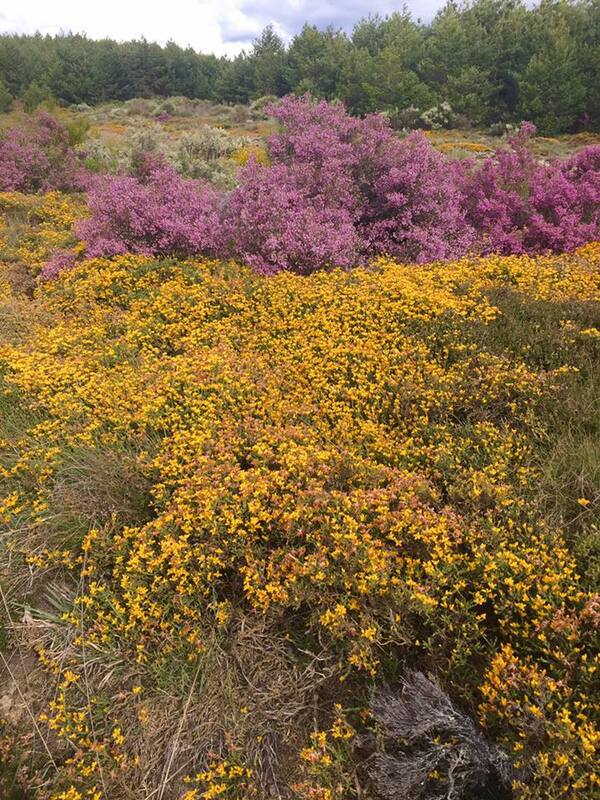 Our 2015 Camino friends, Narelle (& Gerry) raved about the flowers when they Walked, and boy was/is she right!! Walking from the Cruz De Ferro in the mountains between these never ending Wild Flowers. Last year when we walked, it rained a lot in our first 30 days to Pamplona, Burgos, Leon, Astorga, Ponferrada and the Cruz de Ferro. – This year we have been lucky to have had it be mostly dry, minus that Cold WINDY Hail & Rain day from Carrion to Calzadilla. – 90% of the people stop for a Bocadilla, Fresh Orange Juice, etc and visit with other Pilgrims after the decent from the Cruz De Ferro. – I lovvvvvvve these Walking into Town experiences and seeing Pilgrims sitting at the outside or inside Cafes. Some known friends, sone unknown and some known just by seeing them for days -but maybe not talking; a French Group for instance. – The feeling comraderie and a common experience is so strong, precious, special. 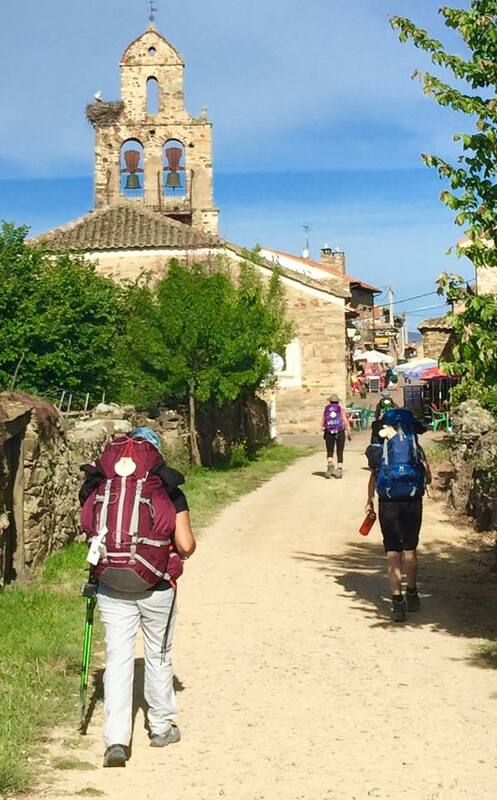 So many have the “Camino Walk,” or “Camino hobble.” Knees, Ankles, Hips, Blisters are many challenges we Pilgrims experience. – I squealed with glee when I saw Felicity and other Camino friends. It is ALWAYS a joy and surprise, who might come Walking by. – A Camino friend could be a day+ ahead or a day+ behind. We never know when a Camino friend will appear. And of course we continually make new Camino friends. Felicity, with Phillip at the table behind her to the right. I walked with a 26-ish year old Italian guy out of Acebo along steep dirt rocky paths and through the next town of Riego de Ambros. 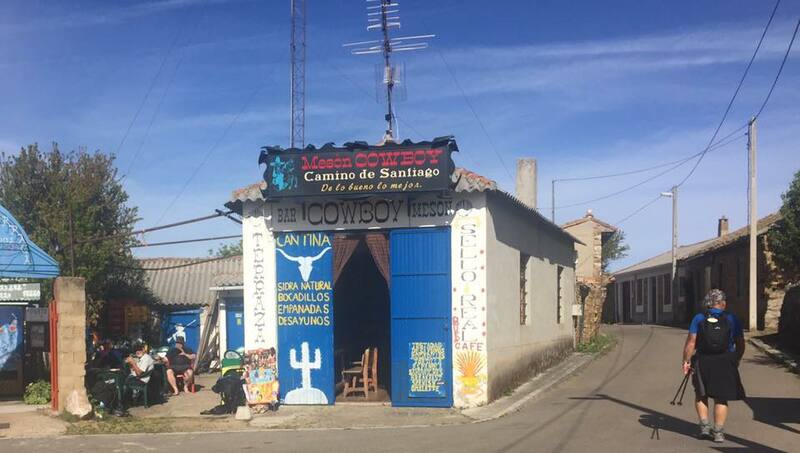 – I wanted to stop and say HOLA to a Restaurant owner in Riego de Ambros but the Yellow Camino Arrows didn’t take me past her Restaurant and I didn’t realize, until I was on a new path headed down to Molinaseca. Oh well, next year. This path from Riego de Ambros to Molinaseca was a new Walk for me, since last year we were told to walk along the Road. – It confirmed for me what I felt last year and have felt this year. – Last year felt less hard than the 1st year. – This 3rd year has many moments of feeling easy on days that typically felt hard. – That feeling of, “Are we there yet?” has not been plaguing me as I walk the last hour+ each day. Now I look at the Time and I realize, It takes me 5-6 hours to Walk 12 miles. So I tell myself, “You have another hour.” Then I just relax into it. – The other part is, being familiar of where I am, everything seems less far. It is just a 5-6 hour Walk, like anyone I might do at home. TODAY walking the last 1-2 hours from Riego de Ambros to Molinaseca was similar to my first Camino. It FELT long, hard, and I had that feeling/thought “Are we there yet?” So I looked at my watch and told myself, “You have until 2pm.” It helped, but the unknown of it all was still palpable uncomfortable, in comparison to the “familiar” and knowing. – It shows me the 1st in ANYthing I do, can me, might be uncomfortable. So, I do it, and each time it gets more comfortable & easier. At 5pm David and I walked though Molinaseca a Pilgrim town but also very popular with Spaniards for the Gold Mines, etc. – It is soooooo much fun!! We never know who we will bump into. – Low and behold, there was Julie. from Darwin, Australia. We met the FIRST night in St Jean. Then we run into each other from time to time for the first 5+ days. I hadn’t seen her for 20-ish days. Of course the 6 Canadians who knew her from the 1st might too, would give updates if they had seen her. – Then popped in mom Helen & daugher Alex (Ally Jargan) from Sydney, Australia. They also knew Julie from many days ago. – It is ALL so fun and Crazy! Photo of my “Home Girls” that I stayed with in the Dorm Rooms, while David was in Leon trying to get healed. After leaving our Albergue we had a short climb up to the Cruz de Ferro, or Iron Cross. This is an iconic location on the Camino where pilgrims stop to leave a small item at the foot of the cross, say a few words, and leave their cares or concerns behind. – This year I gave thanks for being able to continue along the Camino even though most of my travels have been by vehicle. – Every Camino is different and every Camino is an individual journey. Mine this time has not been what I expected but it has its fulfilling moments all the same. – Many, many other pilgrims ask about my health and wish me the best, even though they may have challenges of their own. You are never really alone out here:). That’s one of the great things about it. 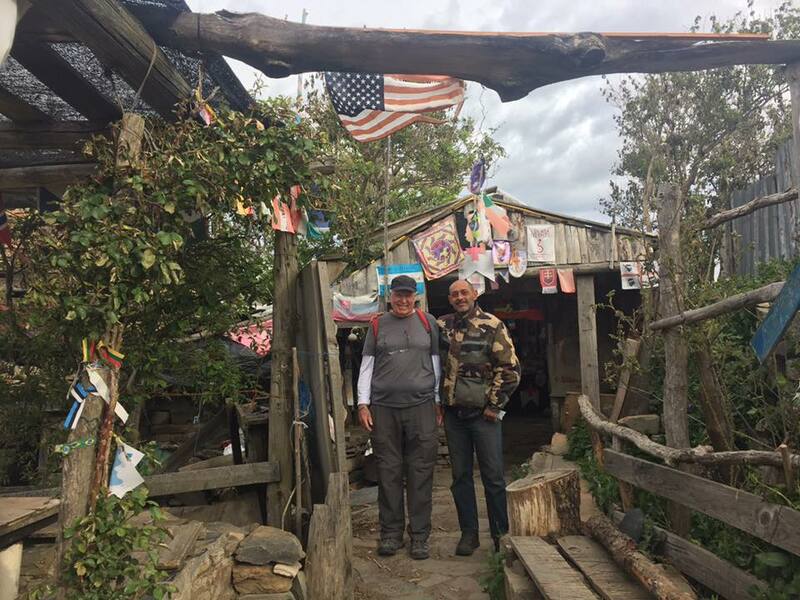 I walked up to the cross and further to Manjarin, which is a donativo Refugio that a man called Tomas has kept for 24 years. – I stayed there and had a nice conversation with Jose, who helps Tomas, while I waited for a taxi. – The taxi was necessary for me because the rest of the day was steeply downhill over rocks and slate formations. It would have been very difficult for my knee. Molinaseca translates as “dry mill”. I am surmising that there was once a grinding mill powered by the river here. If that is true there is no physical evidence of it that I have seen. – As we entered the town we crossed an ancient stone bridge with several arches. It is called Puente Romana so I am also assuming that it was built by the Romans. Also, I misspelled the cuisine yesterday. It is Maragatos. My bad:). We left Cacabelos and stopped at the same Cafe/Bar as last year. The FIRST one!! Bathroom CALLed!! – I got to talk to Heather from Australia, who we had met a few days before. – Then I heard, “Cathy! !” “You are the woman that was doing stretches in Orisson! !” It was Julie from Liverpool, England. We had since each other since then, 29 days ago!! We stopped in Hostal Virgen de la Encina, in Ponferrada to say HOLA to Luis, the owner. It was barely 10am, and he wasn’t there yet. – I left him a Card and a Note. It was hard for me to show up to Ponferrada, take a few pictures of Templar Castle from the 1400s and Walk on. I wanted to stay longer, but there was no REALLY reason to linger. We spent many days there in 2025 and 2016. We headed out of Ponferrada through a nice City Park. – Walking thru the Park along the River, Keith, one the Canadians. He came Walking up behind us. We walked and talked for awhile. He gave us an update on Inuka, Phillip, Rene, Brian, Helena. Camino friends since St Jean, Day 0. – Peter & Mari from Melbourne, Australia that I walked with into León, days ago. – Felicity, from Day 2 and now many days Off and On since then. – Brian, whom we had just walked with, but he walks faster than us so when he takes a rest, we get to see him. Felicity asked, DO you know ….? I love responding to my FB Posts, Messages, Emails, etc. – Either the WIFI doesn’t work, or I am busier than the last 2 years, or maybe I just fall asleep because I am tired. – If I don’t respond right away, I will!! – I love getting your messages while here Walking the Camino!! They make me SO HAPPY when I see them!! It is so AWESOME for me to be Walking the Camino again, with my/our online Camino Family as well. British friends, Andrew & Sheila, having a Picnic along The Way. Prior to leaving this AM we had a rainstorm come through with more rain a possibility during the day. Fortunately we dodged it and were ensconced in our nice hotel before it showed up at 5PM. – The day included going through Ponferrada where there is a renovated Templar fortress. It is huge and very impressive. We have stayed in Ponferrada for the last two years so it was strange to just walk through. I walked about 8 miles today before my knee requested a taxi ride:). Things are slowly improving. Cacabelos has 5500 citizens so it’s a decent sized town and it’s known for the quality of its wines. Lucky me:). In pre-Roman times the region was populated by the Astures, a Hispano-Celtic Gallaecian people. They were conquered by Emperor Augustus in the Astur-Cantabrian Wars (29-19 BC) and the area quickly became the largest mining center of the Empire during the Roman period, where gold and other metals and minerals were extracted. Numerous Roman mining sites are still visible in the area, one of the most spectacular being Las Médulas, a UNESCO World Heritage Site since 1997. Romans also imported grapevines, and wine production thrived in the region until the propagation of Phylloxera at the end of the 19th century, which destroyed the majority of the vineyards. The modern name of the city derives from the iron reinforcements added to the ancient bridge over the river Sil (Latin pons for “bridge” and ferrata for “iron”), commissioned by Bishop Osmundo of Astorga to facilitate the crossing of the Sil River to Pilgrims in their way to Santiago de Compostela. The railroad arrived in Ponferrada in 1881, and during World War I local tungsten deposits were exploited to supply the arms industry. – In 1918 the Ponferrada Mining, Iron and Steel Company (Spanish: Minero Siderúrgica de Ponferrada (MSP)) was founded to extract coal deposits in the region, and it grew to become Spain’s largest coal mining corporation. – The Spanish National Energy Corporation (Endesa) was founded in 1944 and in 1949 it opened Spain’s first coal-fueled power plant in Ponferrada, Compostilla I. – In 1960 the Bárcena Dam (Spanish: Pantano de Bárcena) opened and by the second half of the 20th century the economy of the city was mainly based on mining and electricity generation, both hydroelectricand coal-fueled. – Starting in the late 1980s most mines were closed, and after the collapse of the mining industry Ponferrada was for a while in a crisis. – However, in the late 1990s the city underwent a major transformation with the establishment in the city of several industrial and services firms, the reintroduction of commercial wine production, the opening of a local branch of the University of León offering several undergraduate degrees, and in general a radical improvement of the town’s infrastructure. – The economy is now based mainly on Tourism, Pilgrims, Agriculture (fruit and wine), Wind Power Generation and Slate Mining, with a mild but constant population increase. I notice sometimes in the mornings before I get started, I have a bit of angst. – Once I get started Walking EVERYthing feels HAPPY!! I guess the lesson is …..
– The morning fresh air feels exhilarating! – The smiles and “Buen Camino” of the Pilgrims all around make me feel included. – Pilgrims Walking on the path in front of me and behind me give me a sense of safety and community. – Seeing Old & New Pilgrim friends in Cafe/Bars is SO fun!! This goes on ALL day, On the Camino. The last few days it has been RAINING, but so far, more at night. It started off sprinkling this morning. I wore a Poncho with my Raincoat ready to put on at a moment’s notice. – 10 women from the Canary Islands; southerny part of Spain. This is their last year -They plan to arrive to Santiago on May 20. 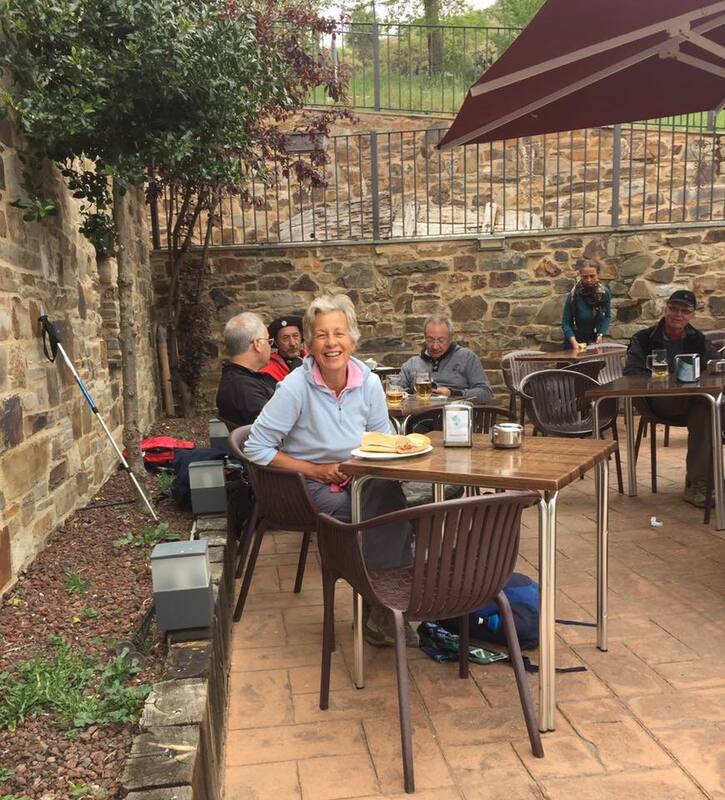 They, like many Europeans, are Walking the Camino “en Tapas,” 2 Weeks each year. – 12 people from Germany that met once they got started in Burgos. They have a Camino Company that set up there Lodging, etc. – 3 women from Perth, Australia. I love when they say, “Good on you! !” They love soooo many of the Australian expressions!! They are SO fun! Why the Camino Frances, again, and again and again? – It has the BEST Infrastructure. – We enjoy Returning to say HOLA! – We like seeing Places we Love!! – It is fun to have Familiar & NEW. – The Length is GREAT!! We had rain most of the night and light rain all day during our walk of 20+ kilometers. The first 10 K was uphill to Villafranca del Bierzo so I taxied up. – After arriving there the rest of the day was spent walking parallel to a river that runs around the various hills. It’s up all the way but it is such a gradual slope that it’s not noticeable. – The rain necessitated wearing our ponchos. These ponchos are designed for wear with a backpack so they are roomy and allow sufficient air flow so you don’t overheat. They are much better than rain suits and backpack covers in my opinion. We also wear Gore Tex lined boots, ours are Salomon but get boots that fit YOUR feet and get them a size larger to account for swelling, to help keep our feet dry during rain or wet walking conditions. El Bierzo is a district in the Spanish province of Leon. Villafranca del Bierzo has a very old history. The first human settlements in the area date to the Neolithic age, while the first historically known people living here were the Celtiberians, who lived in Bergidum, later known as Bergidum Flavium after the Roman conquest. – In the Middle Ages, the town is first mentioned in 791. The origin of the modern town are connected to the Way of St. James, as a rest place for the pilgrims which started to reach Santiago de Compostela from the 9th century. In the Codex Calixtinus Villafranca is mentioned as an intermediate stage between Rabornal and Triacastela. In 1070, during the reign of Alfonso VI of León, a Cluniac monastery was founded here to cultivate wine, and a borough of French pilgrims rose around it, from which the town’s name (meaning “French Town”) stems. The town later received numerous hotels and hospitals for the pilgrims. – In the late 12th century Alfonso VII of León gave the lordship of Villafranca to his sister Sancha. Later it went to Urraca, wife of King Ferdinand II and then to Teresa, wife of Alfonso IX, and then to numerous other noble people. In 1486 the lordship became a marquisate assigned to Luis Pimentel y Pacego: his daughter married Pedro Álvarez de Toledo, whose family thenceforth held the marquisate for centuries. – During the Peninsular War Villafranca was the headquarters of the Galician army and was sacked three times by the English troops, and was later occupied by the French troops. – The Spanish general Antonio Filangieri died here. The town was freed in 1810. – The population now is about 3500. People are saying “Online” there are NO BEDS, and so many people. This is my observation & experience here on the Camino right now. 1. -The Hospitaleros say there are “less people” than last year. 2. -People that show to get a Bed between 1-2:30pm have NO Problem. 1-2-3 Albergues probably will have a problem. 4. -The Cafes are Full. Once walking the paths, the Camino is as lightly sprinkled with Pilgrims as usual. – Ask a person at the Cafe to Call and Make a Reservation for a Bed. They ask your Name & NO money until you arrive. ANY more questions, MESSAGE me! It used to be hard for me to leave David in the morning if he wasn’t walking with me. In regular life I am often the last to leave ……. – A Party, as I help clean up, etc. – My Classroom, as I prep & prep!! It is easier for me now. – I feel independently stronger now. I say…..”See you in a few hours. I left with a Raincoat & Poncho as it was raining-ish. As I was Walking my safety pin holding my Water Repellent Gloves must have opened because I heard a man calling out something behind me. I turned around to see him holding up my black gloves. – I walked back to say “Thank YOU” AND retrieve my Gloves from him. We ended up talking for a bit. – SLOWLY & Sep-ar-at-ting each Syllable and looking at the person so they can see my eyes, mouth and expression. – If the person responds in English or Spanish I speak normally in either Language. I can tell from how a person responds if they can speak a lot or a little English or Spanish. If they do not, I try to communicate with them either with Google Translate or in “ESL;” SLOWLY & Sep-ar-at-ting each Syllable. The response has been so fun and enjoyable. I am responded to with big smiles. – With this gray haired man from Belgium I decided to speak “ESL” as Google Translate would necessitate my phone and it was raining a bit. We both raised our hands in surrender and laughed. As often is, he spoke some English and I spoke ESL, so we had a fun 20+ minute Walk & Talk. – His name is Loris Pellegrini. – He’s from Belgium; Italian roots. – He is 65 years old, born March 1952. – I told him I was 64, born November 1952. I asked him, “Where do you plan to sleep tonight?” Like MANY Pilgrims, he Walks until his “feet” say they want to STOP. He PROUDLY showed me his “Map” for the Camino!! It was a POSTCARD in had bought in St Jean 30 days ago!! – I laughed OUTLOUD, and gave him a Thumbs Up!! VARIETY of Pilgrims, human beings, people on the Camino. NOTHING, they happily follow the arrows from Town to Town, and Pilgrim to Pilgrim, and find a place to sleep when their “feet” tell them to. This Pilgrim had a ……Map on a PostCard with only the names of ????? Cities on it. I am the last Pilgrim. I used to hold my Handkerchief in my hand, but there were the times I would take out my Phone to take Photos, and I’d release, I must ha e dropped my Handkerchief. 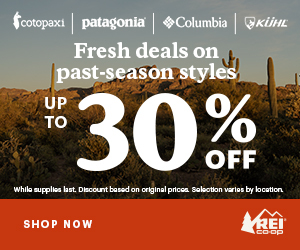 – Then I would Pin it to my Shirt, or my Pack or my Hiking Pole. That worked. Now I have a FAVORITE way to NOT Drop my Handkerchief. Thanks to my favorite Aussie Camino Friends. – I have a Handkerchief that has an Elastic Sewn to the corner and I wear it like a Bracelet. I can have it hanging down or tucked into the Elastic. I know I am NOT the ONLY Pilgrim with this challenge because I see MANY Tissues AND a few Handkerchiefs EVERY day On the Camino. As I did On Camino #2, I often stop in to say HOLA to Hospitaleros or Pharmacists or Shop Owners, as I go Walking by. – Now at Camino #3 they believe me that I might really be back. It is REALLY fun for me, and for them too. The MAIN reason they remember me On the Camino, is because for Camino #1, I brought 50 PostCards from San Francisco. EVERYone knows “Golden Gate Bridge” and San Francisco. – Every afternoon when we would arrive, I would Pay, get my “Sello,” Stamp for my Camino Credential and I would ask for the WIFI Password. – Then or Later in the afternoon when they were not so busy accommodating Pilgrims, I would give them the Postcard. With our Names, Contact Info and an invitation to visit us in California, on the back. – The reaction varied but always appreciated!! Sometimes tears would come to an older woman’s eyes. Other times they would call their husband and say, “¡¡Estamos invitados ir a California! !” Many times they would put it up on their Bulletin Board with other Pilgrim Cards and Photos. On Camino #2, I used “VistaPrint” and had 50 Cards made with our Photo taken at Golden Gate Bridge. Everything was printed on it, so I didn’t have to write it each day. On Camino #3, same Card, New Photo. Some Albergues now have all 3 Cards. Many of us on the Camino think of Walking up to O’Cebreiro, as an EFFORT, similar to the Pyrenees. It really isn’t that difficult. It is broken up to 3 parts, with 3 Bars. 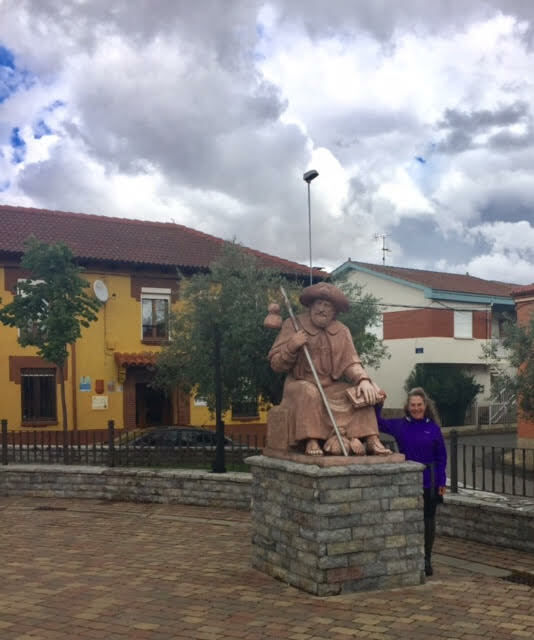 Last April/May when we walked, it rained more in our first 30 days; Pamplona, Burgos, Leon, Astorga, Ponferrada, the Cruz de Ferro and O’Cebreiro. – This year we were lucky to have had it be mostly dry, minus that Cold WINDY Hail & Rain day from Carrion to Calzadilla. Today, and the last few days, it has been raining off and on. Today more ON, than Off. It is okay. – The rain isn’t really a problem. Not being able to take photos is a disappointment, but not terrible. Not being able to type my thoughts while walking is missed, but no biggie. -With Raincoat, Poncho, Weatherproofed Gloves, Wide Rimmed Hat and Gaitors over my Hiking Boots -I am good to go!! O’Cebreiro is located on the top is beautiful mountains. – It is all stone streets and buildings. – Tourists from all over Spain and the world can Drive up or come in Tour Buses. Last year it was a visual SHOCK when I came Walking up the Hillside along the stone walls and I turned into the Pueblo of O’Cebreiro and their were women with purses, make-up and highheals. I had to remind myself that I am one of the “Lucky ones” that gets to “Walk the Camino” through the mountains and all its splendor. – I was mentally prepared this time. Last year a charming nicely dressed woman from Spain asked where David and I had started walking from. I have to admit I enjoy saying, “St Jean Pied de Port, Francia,” because their response is always positive and surprised. – This happens in Santiago as well, when we first arrive to the Front of the Cathedral where we take our Photos. – If there is a Tour Group with a Guide, she will often ask, “Where did you start?” Etc Etc It’s fun! – t’s a 730 meter elevation increase with the last 650 meter increase in a horizontal distance of 6 kilometers. That’s a slope of 9.75 degrees! – Most of it is rocks, dirt, and slate. By the way, it rained all day. That equates to slippery rocks, slippery mud, and slippery slate. – To add to the fun, some pilgrims ride horses up this part of the trail due to the severity of it. – Where you have horses you have the stuff that occasionally comes out of the back of the horses. When you mix that with the mud and water trust me, you don’t want to wipe off your boots with your hands. – By the way, I rode a horse today:). It was good for my knee but not so good for the higher up anatomy. – After two hours we reached the top and were able to dismount. Imagine 5 bow legged pilgrims gingerly walking through a downpour and trying to find their Hostal. At least our boots were clean:). – By the way, Cathy walked the whole thing! It took about 7 hours. But she stopped at he Cafes and took her time. We awoke to the beautiful green hills and mountains of O’Cebreiro. It was Not Raining but it was Cold. The weather is not an issue. I have what I need for Cold and Rain. Sunny HOT would be difficult. I left wearing my …..
With my Poncho out, ready to go! David & I walked into a Bar/Cafe after a nice 1.5 hour cold/refreshing up and down walk through the woods. – David saw the Danish man & woman walking with the “troubled youth.” Yesterday David and I assumed the man was the boy’s father. Today as the woman and I were “waiting” at the Bathroom door, I asked if she was boy’s aunt or the mother. At that point it was when she explained to me that she and the man work together helping “troubled youth.” This is his 3rd time bringing a high school age boy “On the Camino” to help him turn his life around. Each time it had worked. – LESS expensive and possibly MORE effective, than $10-30,000 for a Month of Rehab in the United States. We were about to leave the Cafe when a woman walked up to use our table. I recognized the woman with her, but remembered her as not being interested in pleasantries so I turned to leave. – The first woman was talkative, asking where we were from, where we had started our camino, etc. – It turns out they were sisters Walking the Camino together. From Minnesota & Arizona. This interaction with these 2 sisters led me to a lot of thinking, discussions with David and a bit of tears, during our 6 hour Walk, from the high country of O’Cebreiro, to the lower hills of Triacastela in Galicia. On the Camino, as in Life …. Now, of course at age 64, I should know all of this, but ….. I didn’t. – David appears the same to me. I was envious because I knew this caused me to be more dependent on others. – This got me thinking that my “innate” Extrovertness was what I was born with. It is not like I had any control over it. On Camino #3, during the course of the past 32 days, I have needed to do more things “on my own,” with David in Leon, recuperating, while I was Walking. The word “loneliness” and “loner” are similar. Interesting. As I continued Walking down the hill, I thought…..
– I am grateful for these awarenesses and learnings. – I don’t ever want to be offensive or “too much” to anyone. As soon as I feel/notice someone is not engaging, I back off. It is embarrassing to admit, but often I am like an excited “puppy dog,” ready to jump, run and play. The more I continued to understand and think about the difference between “extroverts” -ME, and “introverts,” the sadder I got. – Wow, there was a part of me that just wanted to CRY!!! – I never wanted to annoy, bother, irritate anyone. – I learned over years, if I had the opportunity to help someone, then “who I was,” and how I came across, was then okay and appreciated. – I never really did figure it out, so I just tried HARDER to be “nice, kind and helpful” and sometimes it worked, at least for moments. But who God made, has done that, inadvertently. – I have learned to work with it, as I have done with my ADD, ADHA, OCD, but those things really only challenged me. This has been a challenge for others, and for that I felt/feel sad. – I guess I am grateful that “I can teach this old dog new tricks,” and hopefully I will have another 30 years with this clearer consciousness. – Good thing I am a “Me Too Iguana”, kinda gal (Read a past Camino Post, for that explanation.). – Sadness came over me again. Now I understand why, just my “existence” was an irritant to some. I have felt badly about myself and how I have been my whole life. – Even though, now at age 64, I know I am a GOOD person and MANY people LOVE me. Thanks to my friends and ALL of my Adult School & College Students. I wouldn’t even admit to being an “Extrovert,” as if it was a bad word, bad thing to be. Because it meant I was “Too much” for others. I can say, I am grateful my sons, now at ages 35 & 40, know that my “puppy dog intentions” are ALWAYS good. This doesn’t give me, a “Get Out of Jail Free” Pass. Where else, but On the Camino, would one have 6+ hours, for MANY days -to think, talk, discuss and learn. We went UP yesterday. Today we went DOWN. 2000 feet. Of course, there were a couple of ups thrown in just to make it interesting:). – When we started at 8AM it was about 3*C with some wind. As the day progressed the wind picked up and about half way through rain started again and lasted for most of the rest of our walk. At times it was blowing sideways! – It was a 13 mile day today. Just a long downhill walk. I did walk it all today for the first time since our second day. My knee is achy and the downhills are still troublesome, but I don’t believe walking is causing any damage. We will evaluate each day’s terrain and decide what I will do. Today we decided to take the “Alternative” route and Walk to “Samos,” instead of “Sarria” because our 2015 Aussie Camino besties RAVED about it!! – David describes it below. We left O’Cebreiro yesterday and Walked down, down, down into the rolling hills and Tree lined Dirt Paths and green Wildflower fields and Villages of Galicia, where we sometimes share the space with Cows being led back to the Barn. – In Galicia, we Walk through MANY little Villages with 5-10 buildings in them and plenty of Cows, Chickens and Roosters. If a person does not have 35-40+ to Walk -SJPP to Santiago here are more Options. — Special to Walk to the Ocean. If you want ANY help planning your Camino, I am HAPPY to help. The Camino is my FAVORITE topic of conversation. – Facebook Message or Email me. Marta Marquez was the Host & Interviewer. An adorable 31 year old that has been on television since she was 19, or maybe even earlier. – It was fun and a little crazy. – We would be Walking and Talking and up would come some of my Pilgrim friends and they had no idea what was going on. I would explain it as well as I could. – Again, Pilgrims & Locals watching. – Making a Documentary/Movie is a LOT of hard work. These 30-40 year old TV people worked hard!! – I am 1 of 50 that they will Interview and Walk with. – I was EXHAUSTED after the 5+ hours. Ha!! – Walking my 7 miles to my Alberque was refreshing! It turns out, these Pilgrims were filmed with me, my Camino friends that I bumped into. – Angela from Adelaide, Australia has been a friend that I see off and on for the past week. Since David started walking again. – Michel from Italy was the YOUNG man that I walked with after the Cruz de Ferro. Walking out of Acebo & through Riego de Ambros, towards Molinaseca. – Joop from Holland. We first met in St Jean 33 days ago. We don’t see each other often, but when we do, we are both pleasantly surprised!! – 3 Women from Perth, Australia, that David and I had met at Breakfast in Cacabellos. – 3 Women from Biarritz, France that I and the Host had spoken to as we Walked in the morning. The owner of the Bar/Restaurant and I took Selfies when it was all over. – I told her I would be back next year and we can talk about the Documentary. I see moms or dads Walking with their Adult Children. What a TREAT!! – Both my sons are gainfully employed, with wives and children, or child on the way. – This is ALL good, but leaves NO possibility of them Walking a week or more of the Camino with me. In my random Playlist, a song by Laura Niro keeps coming up…. When I’m dead dead and gone…. – I have decided, “When I die,” I would like my ashes spread in all of my Walking places. David and I soooooooo enjoy the different Albergues & Hospitaleros. – Our San Mamed del Camino Alberque was “on” the Camino Path, in the countryside before Walking into Sarria. – There were 5 French people next to me. The man was proud to tell me he was 70 years old. I am proud to spend time with such interesting active people. I use Google Translate to communicate. It is FUN! – The were about 30 Pilgrims in total from 10 different counties. All talking, interacting and enjoying themselves in a variety of languages and accents. English seems to be the “common denominator” Language. We decided to “Take the Road Less Traveled” today and go through “Samos,” a small town which contains a Monastery established in the 600s! It’s almost 1500 years old! It is the Monastery of San Julian of Samos. It is an active Benedictine Monastery, and the LARGEST Monastery in Spain. The foundation is attributed to Martin of course Braga. It is known to have been renovated for San Fructuoso in the seventh century, although the first written mention of this event is from the year 665. An inscription on the walls of the cloister of the lodge says that it was rebuilt by the Bishop of Lugo Ermefredo. After this restoration it was abandoned before the Muslim invasion until the reconquest of King Fruela I of Asturias, which took place around 760. When, years later, he was assassinated, his widow and son, the future Alfonso II of Asturias, the Chaste, found refuge in the monastery. That earned the monastery royal protection, starting with the properties in a half-mile radius, which would encourage growth. In the same century it was reoccupied at the behest of King Ordoño II of León and from 960 the community lived under the rule of St. Benedict, but in the twelfth century the Cluniac reform joined with Bishop Don Juan. The monastery of Samos enjoyed great importance during the Middle Ages, which is reflected by its two hundred villas and five hundred sites. In 1558, already incorporated into the Royal San Benito of Valladolid, the monastery suffered a fire that forced its complete rebuilding. The community was dispossessed in 1836, with the confiscation of Mendizabal, but the Benedictine monks returned in 1880. It suffered another fire in 1951, after which it had to be rebuilt again. The first half of our day was slightly up and down until we reached Samos. The second half according to our Camino book was mostly flat. Not!! It was up some and down some with rocks and stone and mud included. Altogether it was a nice 14 mile day. The weather was pleasant with no rain. Our albergue is great with a very nice family operating it.